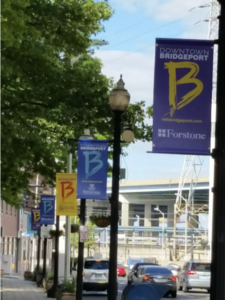 Bridgeport, CT -- Bridgeport’s Downtown Special Services District (DSSD) is proud to unveil its 2017 Lamp Post Banner Sponsorship Program with newly redesigned banners and hanging flower baskets. The Lamp Post Program is a key piece of DSSD’s effort to beautify Downtown Bridgeport and create a welcome environment for residents, visitors and businesses. Besides adding beauty and color to the city's streets, the banners promote downtown businesses, which, by their participation, are demonstrating that they are invested in the success and vitality of the downtown area. DSSD's President/CEO Michael Moore thanks all of the generous sponsors of this program, including AMS Real Estate and Urban Spaces CT, Aquarion Water Company, Artemis Landscape Architects, Artist & Craftsman Supply, The Bananaland, Bob Abbate Marketing, Bridgeport Regional Business Council, Cohen & Wolf, Darien Rowayton Bank, Fletcher Thompson, Forstone Capital, Friends of the Bridgeport Public Library, Ginsburg Development Companies, Housatonic Community College, Joseph’s Steakhouse, Kolmar Americas Inc., Navarino Property Management, People’s United Bank, Spinnaker Real Estate Partners, Trefz Corporation, University of Bridgeport, Webster Bank Arena.